Email marketing is one of the most popular online fundraising tactics used by nonprofit organizations. 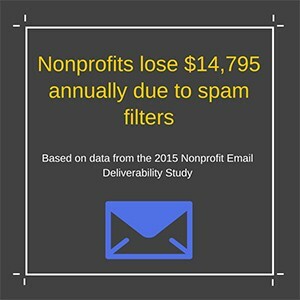 However, according to a new study from EveryAction, email spam filters are causing nonprofits to raise substantially less than they could. Internet Service Providers (ISPs) determine if your email is deliverable based on the reputation of the IP address from which your email is sent. If an ISP sees that emails you send are being marked as spam or are deleted immediately without being opened, then they begin re-routing them to the spam folders or blocking them completely. Once an IP has been flagged as spam, it can take a long time (months, or even years) to fully recover. Brett Schenker, an Email Deliverability Specialist at EveryAction put together the 2015 Nonprofit Email Deliverability Study to help organizations understand the importance of email deliverability and begin using email best practices to raise more awareness and money. The 2015 Nonprofit Email Deliverability Study analyzed 55 national organizations with email lists of 100,000 subscribers or more. The nonprofits in the study used a variety of email marketing platforms to ensure the results would be applicable to the entire nonprofit community. The study found that an organization with 100,000 subscribers, sending 24 fundraising messages a year, results in 1% of email going to spam – which accounts for $1,203.84 potential lost revenue a year. That figure takes into account the benchmark email open rate, click through rate, rate at which people fill out forms, and the average one-time email donation from the consulting firm M+R’s 2014 Nonprofit Benchmarks Study. Additional factors taken into account include the size of the organizations email list, the average size of donations, and the number of fundraising asks. Capital Business Solutions provides fund accounting and fundraising software solutions and consulting services to nonprofit organizations throughout the United States. From Abila MIP to SerraFund to consulting services for Blackbaud products, our team can help you streamline and organize your accounting needs. Learn more by calling 919-821-1244 or by filling out our contact form.